From Laundry Detergent Bottles Into Chairs, The Cycle Continues With The Cava Urth Chair. Multiple Components Are Made From Recycled Materials, Such As Plastic Laundry Detergent Bottles. 100 Percent Of Core Components Are Manufactured From Recycled Post-Consumer And Post-Industrial Materials. Durable Construction Provides Strength And Stability. Seat And Back Cushions Are Generously Sized For Comfort And Upholstered In Vinyl. The Cava Urth Is More Than 99 Percent Recyclable By Weight So Its Life Continues Even After The Seating Experience Ends. Finish On Frame Helps Resist Scratches. 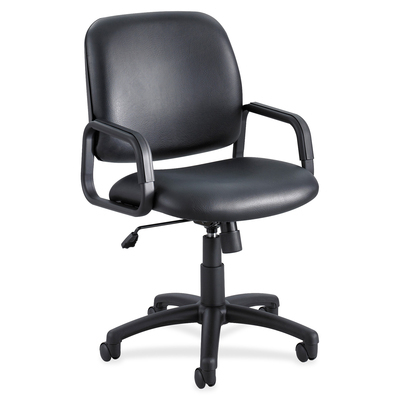 Functions Include Tilt, Pneumatic Seat-Height Adjustment From 16" To 21", 360-Degree Swivel, Tilt Tension And Tilt Lock. Chair Also Features Integrated Arms And A 24" Diameter, Five-Star Nylon Base With 2" Diameter Dual Wheel, Hooded Carpet Casters. Weight Capacity Is 250 Lb..
From Laundry Detergent Bottles Into Chairs, The Cycle Continues With The Cava Urth Chair. Multiple Components Are Made From Recycled Materials, Such As Plastic Laundry Detergent Bottles. 100 Percent Of Core Components Are Manufactured From Recycled Post-Consumer And Post-Industrial Materials. Durable Construction Provides Strength And Stability. Seat And Back Cushions Are Generously Sized For Comfort And Upholstered In Vinyl. The Cava Urth Is More Than 99 Percent Recyclable By Weight So Its Life Continues Even After The Seating Experience Ends. Finish On Frame Helps Resist Scratches. Functions Include Tilt, Pneumatic Seat-Height Adjustment From 16" To 21", 360-Degree Swivel, Tilt Tension And Tilt Lock. Chair Also Features Integrated Arms And A 24" Diameter, Five-Star Nylon Base With 2" Diameter Dual Wheel, Hooded Carpet Casters. Weight Capacity Is 250 Lb.